Top Quality Carpet Cleaning Equipment at Rotovac's Guaranteed Lowest Prices! D.A. Burns of Seattle purchases 10 Rotovac's, One for each truck! Start your own Carpet Cleaning Business! Add a new cleaning crew! Check out our complete carpet cleaning equipment package, which has all the tools you need to succeed. and fits in any size vehicle. 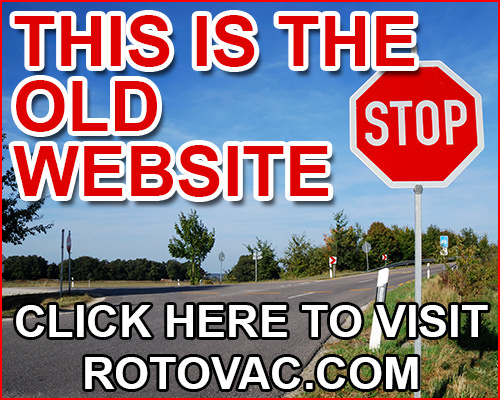 Rotovac is pleased to offer a wide selection of professional carpet cleaning equipment and machines. Check out the exciting brands in our lineup, including DiamondBack, Ninja, and Kleenrite. 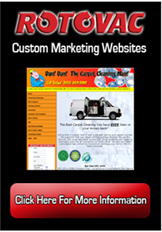 Ready to take your carpet cleaning business to the next level? Upgrade your carpet cleaning equipment to a truck mount. They can provide considerably more cleaning power than a small portable extractor, and are quicker to set up. See how the Rotovac will make a difference in your new business. Every Purchase 100% Satisfaction Guaranteed! There are many different methods of carpet cleaning. Having been in the carpet cleaning business for over 28 years, I have seen almost every conceivable way there is to clean a carpet. Some carpet cleaning equipment and methods are better for fast drying, while other carpet cleaning methods are better for restorative deep carpet cleaning. The following are the three main methods of carpet cleaning. EXTRACTION CARPET CLEANING: Extraction carpet cleaning is widely recognized in the professional carpet cleaning industry as the most effective way to deep clean carpet. A carpet extractor uses a detergent solution that is injected into the carpet by a pump and then the solution is sucked back out of the carpet with high powered vacuum motors. 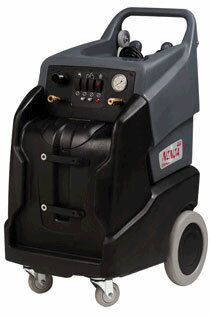 Carpet cleaning equipment solution pumps range in power from 100PSI to over 1000 PSI. Vacuum motors range from 100CFM to over 200CFM. Heaters can be added to carpet cleaning equipment either internally or externally. Hotter water breaks up greasy dirt faster. Since the conception of extraction carpet cleaning equipment in the late 1960?s, the manual extraction wand has been the tool used for the extraction carpet cleaning. The manual wand has a vacuum slot which is usually about 12? wide, along with one or more spray jets to inject the cleaning solution. Cleaning efficiency depends on how much effort and how many cleaning passes the operator is willing to make. The dirtier the carpet, the more cleaning passes needed. Cleaning a heavily soiled carpet with a manual wand requires a tremendous amount of physical exertion to achieve satisfactory results. 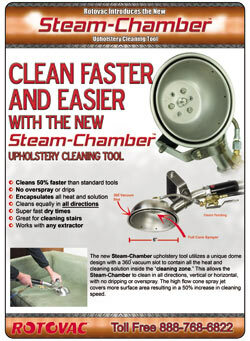 ROTARY JET EXTRACTION: This is the latest technology in the professional carpet cleaning equipment industry and has proven to be the most thorough deep cleaning method to date. The Rotovac Powerwand is a Rotary Jet Extractor that has 6 vacuum slots and spray jets which rotate over the carpet at 250RPM. As the spray jets inject the cleaning solution the vacuum slots simultaneously scrub and extract it back out. The Rotovac vacuum slots clean the carpet from every different direction in a rotary motion rather than just back and forth like a manual wand and the motor does the work instead of the operator. Click here to check out the Rotovac Powerwand. BONNET CLEANING: The bonnet method is good for quick maintenance surface cleaning where fast drying is a requirement. Bonnets are made of synthetic or natural absorbent fibers. Bonnets are round pads that go under standard floor buffers. First a cleaning solution is sprayed onto the carpet and then the bonnet equipment is run over the carpet to ?rub and absorb? the soil off of the carpet surface. This is a good method for fast drying maintenance cleaning only and is not a deep cleaning method. When using the bonnet method for maintenance cleaning it is recommended that a thorough extraction cleaning utilizing commong carpet cleaning equipment is also performed periodically to remove chemical residue and deeper soil. ROTARY BRUSH or DRY FOAM: Uses a foaming water based shampoo that is supposed to dry to a powder or crystal to be vacuumed out of the carpet when dry. The shampoo is applied with a brush and standard floor scrubbing equipment. The brush generates foam as it spins or a machine generates foam before getting scrubbed with a brush. This method is likely to leave the carpet with a sticky residue and therefore its' use is on the decline.